October 29, 2015 – NASA’s Voyager 1 spacecraft made history in 2012 by entering interstellar space, leaving the planets and the solar wind behind. But observations from the pioneering probe were puzzling with regard to the magnetic field around it, as they differed from what scientists derived from observations by other spacecraft. “This study provides very strong evidence that Voyager 1 is in a region where the magnetic field is being deflected by the solar wind,” said Schwadron, lead author of the study. Researchers predict that in 10 years Voyager 1 will reach a more “pristine” region of the interstellar medium where the solar wind does not significantly influence the magnetic field. Voyager 1’s crossing into interstellar space meant it had left the heliosphere — the bubble of solar wind surrounding our sun and the planets. Observations from Voyager’s instruments found that the particle density was 40 times greater outside this boundary than inside, confirming that it had indeed left the heliosphere. But so far, Voyager 1’s observation of the direction of the local interstellar magnetic field is more than 40 degrees off from what other spacecraft have determined. The new study suggests this discrepancy exists because Voyager 1 is in a more distorted magnetic field just outside the heliopause, which is the boundary between the solar wind and the interstellar medium. “If you think of the magnetic field as a rubber band stretched around a beach ball, that band is being deflected around the heliopause,” Schwadron said. In 2009, NASA’s Interstellar Boundary Explorer (IBEX) discovered a “ribbon” of energetic neutral atoms that is thought to hold clues to the direction of the pristine interstellar magnetic field. The so-called “IBEX ribbon,” which forms a circular arc in the sky, remains mysterious, but scientists believe it is produced by a flow of neutral hydrogen atoms from the solar wind that were re-ionized in nearby interstellar space and then picked up electrons to become neutral again. The new study uses multiple data sets to confirm that the magnetic field direction at the center of the IBEX ribbon is the same direction as the magnetic field in the pristine interstellar medium. Observations from the NASA/ESA Ulysses and SOHO spacecraft also support the new findings. “All of these different data sets that have been collected over the last 25 years have been pointing toward the same meeting point in the field,” Schwadron said. Over time, the study suggests, at increasing distances from the heliosphere, the magnetic field will be oriented more and more toward “true north,” as defined by the IBEX ribbon. By 2025, if the field around Voyager 1 continues to steadily turn, Voyager 1 will observe the same magnetic field direction as IBEX. That would signal Voyager 1’s arrival in a less distorted region of the interstellar medium. “It’s an interesting way to look at the data. It gives a prediction of how long we’ll have to go before Voyager 1 is in the medium that’s no longer strongly perturbed,” said Ed Stone, Voyager project scientist, based at the California Institute of Technology in Pasadena, who was not involved in this study. While Voyager 1 will continue delivering insights about interstellar space, its twin probe Voyager 2 is also expected to cross into the interstellar medium within the next few years. Voyager 2 will make additional observations of the magnetic field in interstellar space and help scientists refine their estimates. Voyager 1 and Voyager 2 were launched 16 days apart in 1977. Both spacecraft flew by Jupiter and Saturn. Voyager 2 also flew by Uranus and Neptune. 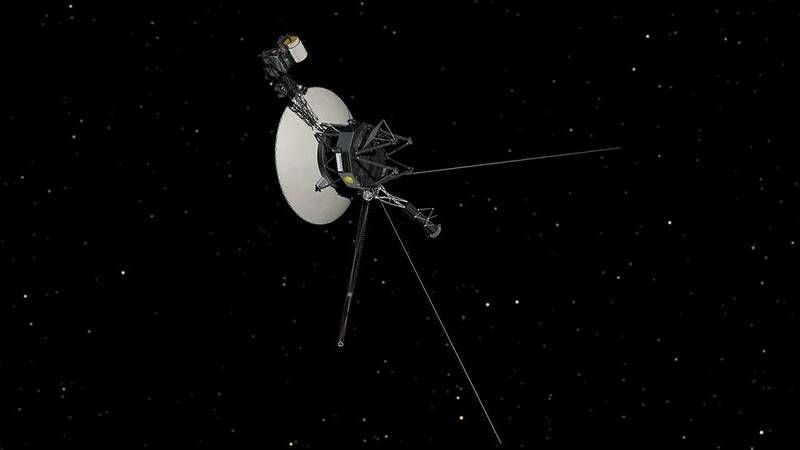 Voyager 2, launched before Voyager 1, is the longest continuously operated spacecraft. Voyager 1 is the most distant object touched by human hands. JPL, a division of Caltech, built the twin Voyager spacecraft and operates them for the Heliophysics Division within NASA’s Science Mission Directorate in Washington. The Laboratory for Atmospheric and Space Physics in Boulder, Colorado provided the Photopolarimeter System (PPS) for Voyager I and II.